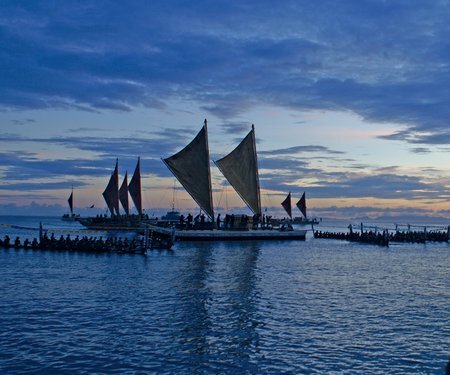 Discover how traditional celestial navigators like Piripi Smith have navigated waka hourua (double-hulled sailing canoes) across the Pacific Ocean without any use of instruments or modern technology. Observe as Piripi shares with us this knowledge that has been passed down for thousands of years and his first-hand experiences about what traditional voyaging and celestial navigation is, why it's important today and what is being done to ensure the knowledge is passed on. He will share incredible tales of sailing stormy seas, and how he and other navigators are nurturing this knowledge for the future. Introduced by Pauline Harris from S.M.A.R.T. Celestial Navigation is a Kupe Dreaming event and part of A Waka Odyssey, a celebration of our place in the Pacific that includes the spectacular Kupe: Festival Opening Night. Download the A Waka Odyssey flyer to plan your journey.